I love throwing big parties with lots of food – but usually there’s just not enough time to spend days slaving away in the kitchen to produce a whole myriad of bite-sized nibbles. This recipe is perfect for when you have lots of guests coming and you would rather not spend endless time preparing finger food. These swirls taste best straight out of the oven. I made these puff pastry swirls in the first episode of my Luxembourg season (which you can watch here) – I was able to cook them in an old, 19th century kitchen at the Musée Rural in Peppange. Unroll one of the puff pastry discs and spread with the mustard. Peel the Träip and cut into pieces and roughly mash with a fork, then spread it all over the mustard, all the way to the edges. Cut the puff pastry disc crosswise into four pieces. Roll each piece up firmly , starting with the corner where the round edge touches a straight edge and rolling it from the outside in, so that you follow the cut line. Lightly pat down the seam of each roll to seal. Meanwhile, unroll the second puff pastry disc and spread with the goat’s cheese. Cut the puff pastry disc crosswise into four pieces and roll up the same way as the Träip rolls. Put into the freezer for 30 minutes. Take out the firm Träip rolls and cut into slices ½ cm thick. One end of the roll will be quite hollow, as the round edge will have rolled up slightly awkwardly– you can merge the last two pieces from the end into one nice swirl, by sticking the very last piece into the hollow centre of the penultimate piece. 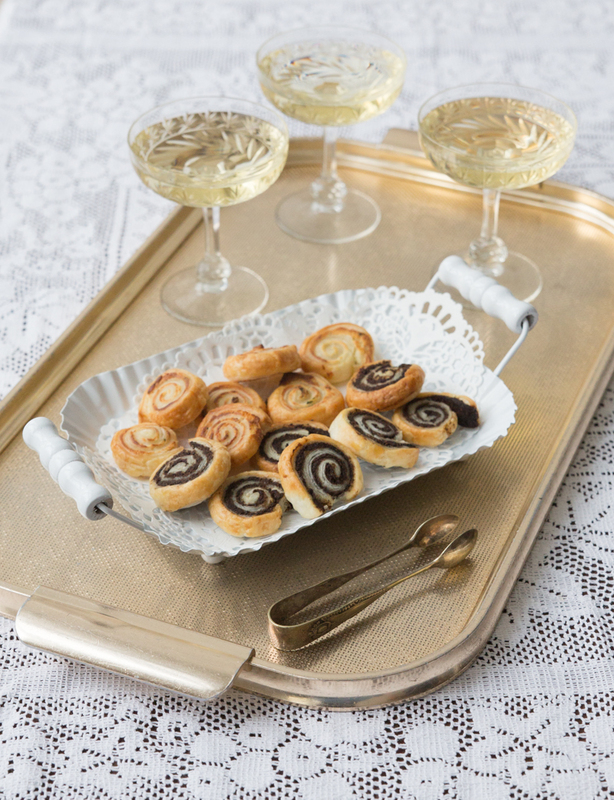 Place the swirls on a baking tray lined with baking paper and bake in the preheated oven for 15 minutes. Repeat with the goat’s cheese swirls. Serve the swirls straight from the oven when still warm.